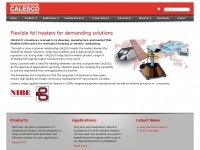 CALESCO's business concept is to develop, manufacture and market thin flexible foil heaters for resistance heating, electric conducting or and antennas. The web server used by Calescofoil.se is run by One.com A/S and located in Denmark. 19 other websites are located on this web server. Most of them are provided in the english language. The websites of Calescofoil.se are served by a Apache server. The HTML pages were created with the latest standard HTML 5. Both the inclusion of the website in search engines and follwoing of its hyperlinks is explicitly allowed.